The Pabst Farms project was of particular interest due to the high end quality and high exposure of all of the buildings within the complex. We fabricated the steel for approximately 12 Pick N Save stores in South East Wisconsin. The Pabst Farms project was of particular interest due to the high end quality and high exposure of all of the buildings within the complex. We participated in the design / build process early on assisting in value engineering to help keep the project within the budget. The structural steel, the steel joist and girders were very involved to detail and to fabricate. Many one of kind components were required to achieve the beautiful appearance of the structures. Incorporated in the architectural details of the buildings we fabricated many decorative iron elements including the canopy brackets and laser cut Pabst Farms logos cut thru door handles and shopping cart corrals. Our vast experience with Pick n Save stores allow us to be familiar and efficient with the shop drawings and production of the steel components. We take great pride in the high level of communication and service we provide to keep our projects on schedule. A complicated geometry of hips and valleys made this a challenging project for our drafting department. Creating a 3D model of the entire framing ensured that every piece of steel fit to amazing precision. The site conditions created another challenge for us. A small jobsite with limited storage space, an adjacent building open for public use and large components for the roof trusses required deliveries be carefully coordinated and well planned. The configuration of the roof framing required two cranes. While one crane held the main truss in position the second crane placed the adjoining trusses stabilizing the entire system. The job was completed on time with a high level of safety and no incidents or accidents. We fabricated the structural and miscellaneous steel as well as furnished the steel joist and roof deck for over 36 Walgreens. Each Walgreens building configuration varies slightly depending on the jurisdiction of the community and its architectural requirements. This particular Walgreens has many architectural elements that required steel fabrication. Decorative awning support brackets, an unusual drive thru canopy and an atypical entry tower adorn this building. Steel lintels, ladders, dumpster gates downspout protectors and a satellite support column are the typical elements that we also supplied. The largest challenge of this jobsite was the front auditorium which was built in the shape of a cone. This project consisted of 68 tons of structural steel and 52 tons of steel joists. Not only did this project occur during the school year while classes were in session, but was in a residential area which limited delivery times and storage space. This required sensitive sequencing and careful coordination of installation. The largest challenge of this jobsite was the front auditorium which was built in the shape of a cone. This presented difficulty in the drafting, fabricating and the installation of the roof framing system. GIS constructed 67 custom built decorative canopy columns as a cost effective alternative to designer columns. The Village at the Bay was a four building shopping center. A total of 67 custom built decorative canopy columns were fabricated as a cost effective alternate to purchased designer columns proposed by others. A full 857 linear feet of canopies graced the exterior of the buildings. For this project, we were awarded the Bronze Award for Stairs Complete at the 2005 National Ornamental and Miscellaneous Metals Association (NOMMA) Top Job competition. An interesting combination of Mediterranean style railings, decorative laser cut risers, stone treads, and steel tube stringers embellish the entry to the retail plaza. Ornamental iron gives this room a more substantial feeling and adds significant value to the home. The owner wanted to create a spectacular impression for guests entering his home. This was our only instruction on designing the curved stair railing. 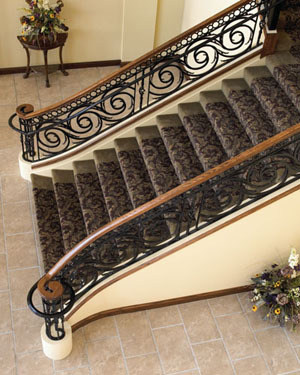 By using ornamental iron as opposed to the traditional wooden balustrades it gives the room a more substantial feeling and adds significant value to the home. Most people are surprised at the affordability of custom built wrought iron and the uniqueness it provides. The incredible feature of this non-conventional gazebo is that the entire structure is clear span, self supporting and the inside is open all the way to the peak. Much time was invested in the planning and coordination of this non-conventional gazebo. The incredible feature of the gazebo is that the entire structure is clear span, self supporting and the inside is open all the way to the peak. This was achieved by leaning shop fabricated moment frames at the corners into a compression ring. The Asymmetric pattern of the structure complicated the process. A temporary tower at the center of the structure was installed and was removed after the entire field welded moment connections were complete. To complicate things further, being built on a city lot, the delivery of the components had to be carefully coordinated so not to choke the other activity on the site. The temporary tower was supported on anchor bolts with double nuts so the tower could be gradually lowered and any deflection of the structure could be monitored. There was only one eighth of an inch drop after the tower was removed. The time invested in the planning paid dividends as the structure was completed weeks ahead of schedule. Coordination of the delivery, unloading and installation of these massive members was like fitting a piece in a puzzle. This project consisted of 71 tons of structural steel and 57 tons of joist & girders including two main girders 10ft deep, 109ft long and shipped in one piece. Coordination of the delivery, unloading and installation of these massive members was like fitting a piece in a puzzle. The center rafter frames were fabricated so that a cross was visible at each peak. This project was on a fast track and had to be on schedule for a highly publicized grand opening. Intricate details and ever changing sequencing did not keep us from having the steel fit perfectly and meeting all of the deadlines. The Cheesecake Factory restaurant, located in the Mayfair Mall Shopping Center was exciting and full of challenges. The General Contractor was based in Boston Massachusetts yet we were able to maintain a high level of communication throughout the duration of the project. Our facility is capable of shop assembling large fabrications – saving significant time on site as is the case with the domed vestibule roof shown here. For this project, we were awarded the Gold Award for Interior Railings at the 2006 National Ornamental and Miscellaneous Metals Association (NOMMA) Top Job competition. The unique railing was fabricated using no forging techniques. A significant amount of time was spent creating the shop drawings in CAD. Laying out the scrolls to fit the geometry of the stair configuration proved to be quite a challenge. The CAD file was then used for the CNC machine and the decorative panels were burned out of a flat sheet of 5/8 inch steel plate. After the panels were cut vines were woven through the pattern and individual leaves of varying shapes and sizes were welded into place. The railings were then powder coated black. For this project we were awarded the Gold Award for Interior Railings at the 2004 National Ornamental and Miscellaneous Metals Association (NOMMA) Top Job competition. This monumental stair in the clubhouse main entrance of a private country club makes a grand statement to visitors. Laser cut panels from 3/4 inch steel plate, stock basket pickets, and cast iron components emulate a railing forged over anvil from years past. The design of this contemporary home incorporated a clean irregular shaped stair that seems to have its treads floating in space. This was accomplished by using a single steel tube for the support stringer and steel bent plates that formed the risers and blue stone tread supports. Every angle viewed of the stair provides a unique independent perspective. The structural steel bridge on the second floor and the stainless steel railings harmonize with their surroundings.